Although their campaign has concluded, if you would still like to make a donation to support the Nursing Student Uniform Fund, you may always do so here. 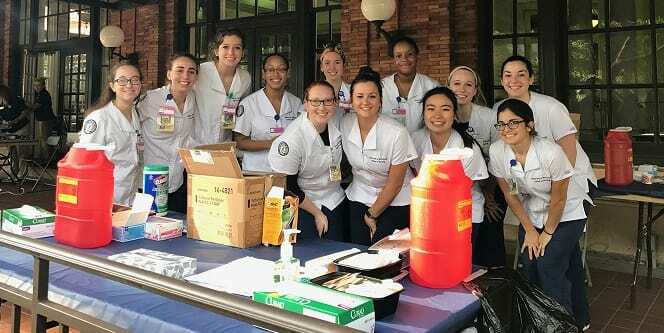 The University of Pittsburgh School of Nursing changes the face of nursing practice by preparing nurses to deliver the highest quality care — care that is guided by research, intellect, and passion. Each year, 150 second-year BSN seeking students begin the clinical rotation portion of their education. As you well know, this hands-on learning experience is imperative in preparing our BSN students to provide high quality care in Pennsylvania, and all over the world. We want to help our students begin their clinical placements on the right foot. Our project will support our incoming students as they enter their second year, by purchasing each of them their first uniform. Each uniform has a cost of $50 and will be worn throughout their time in clinical hours — throughout their second, third and fourth years at Pitt Nursing. A gift today will help supply each member of the BSN Pitt Nursing class of 2022 with a new uniform of their own. That is why we are calling on alumni, friends, and supporters of our school to provide our students with this gift. Contribute today, and make a real difference for our Pitt Nursing students! *Gifts that are made over our $10,000 goal will support the uniform fund for future classes. A vital part of a Pitt Nurse’s uniform, your gift identifies our students in the clinical areas as trainees and students of Pitt. The whole package! Giving at this level, you will supply a uniform to a student. Your gift will make sure they are ready for the first day “on the floor” and for the rest of their career. What is better than one nursing student? TWO! Your gift will outfit two of our students with their full uniforms for their clinical rotations. Supporting each other is just as important as individual learning at Pitt Nursing! Did you have a group of friends that helped you through your clinicals? Giving at this level will provide uniforms to five nursing student classmates! Your gift of $500 will provide 10 uniforms. That means 10 proud Pitt nurses will greatly benefit and appreciate your gift! Be historic! Your gift will purchase 20 full uniforms (10% of our enrolling students for the fall), outfitting the next generation of nursing “trailblazers” for their next big step.